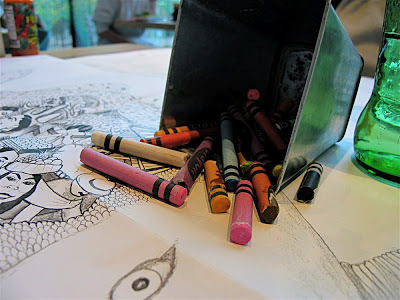 “Dinner with Crayons” is my occasional series of weekend kid friendly restaurant and cafe posts. My 3 year old accompanies me to the main UK chains, some independent places and who knows, somewhere more glamorous if we don’t get kicked out. 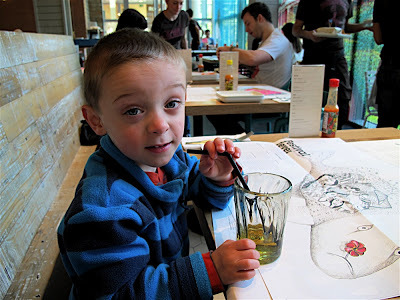 Second time around taking Ted to Mexican chain Wahaca at Canary Wharf. Previously we had enticed him from his latest craze, Zing Zillas’ Fruit Squashing Game, with the promise of riding on DLR trains. Imagine the disappointment when instead we took him to Wahaca. Dragged away, we took a jolly ride to Lewisham and back. Thankfully today Ted was hungry. 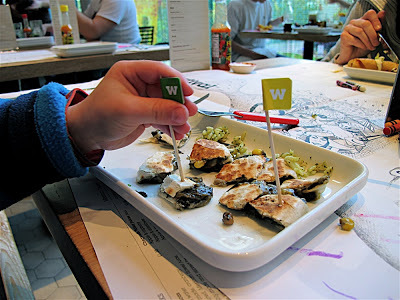 Wahaca was opened by Thomasina Miers, former Masterchef winner and writer of Mexican Food Made Simple. There are 2 other branches in Covent Garden and Westfield White City. The Canary Wharf branch boasts a roof top terrace and forms part of the Park Pavilion opened in late 2009. The glossy city surroundings made me nervous. Blue glass office blocks and two foot Krakatoas don’t mix. 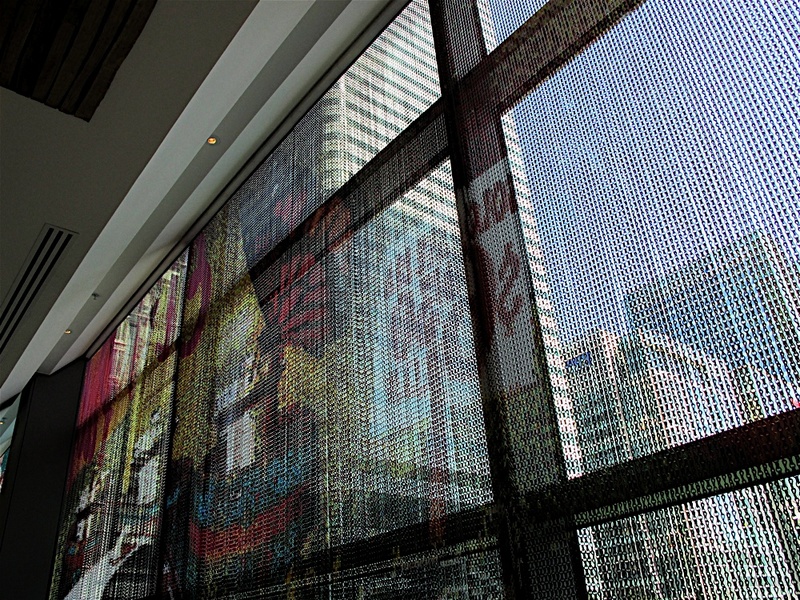 Swanky looking Roka dazzled next door. An air of calm waited to be shattered. Was this the kind of joint that had high chairs? I need not have worried. Proper crayons were a good start. A tin pot, rather than packs of pencils that merely scratch paper. Wahaca’s fold out newsletter featured black and white illustrations waiting to be adorned in wax. 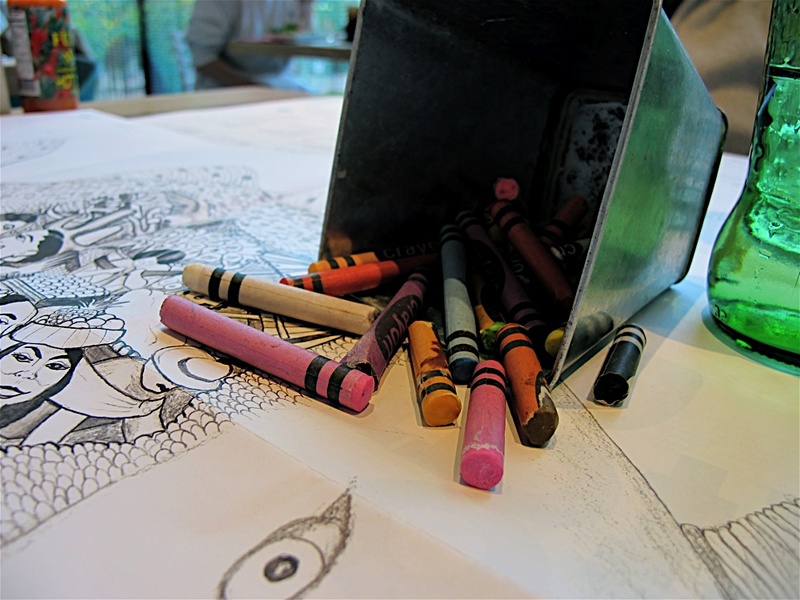 Colouring books don’t come much more funky than this. A wall of high chairs is tucked out of sight from the doorway. Ted no longer needs one but they had around a dozen. Further proof of Wahaca’s child friendliness was the breast feeding festival in progress. Sixteen new mums and dads with stylish buggies and carefully positioned muslin cloths over small babies’ heads. They’re more upfront, pardon the expression, about breast feeding in Walthamstow so this modesty amused me. So there you have it. Wahaca at shiny Canary Wharf was as far away as I’d imagined a child friendly eating destination. Yet they’re fully equipped and happy for you to bring your own food so to speak. What about nourishment for those on solids but delicate tummies? I present to you the Quesadilla Huitlacoche, £3.59, a toasted tortilla filled with Mexican corn mushroom, British field mushrooms and lots of melted cheese. In plain English, it’s a non spicy cheese toastie. Ted tucked in and played with the cute W flags on sticks. The only flash point was a ceiling height chain curtain. Ted briefly wanted to entangle himself. Fortunately we lured him away. My husband and I ordered the “Wahaca Selection”, £19.95 for five dishes, an excellent introduction for newcomers. Since I’m writing this some weeks later, rather than risk labelling something incorrectly, I have given a list of the dishes underneath. 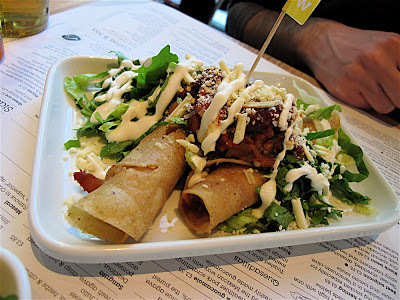 There is some seasonal variation on the Wahaca menu so dishes may differ slightly. All dishes were tasty and fresh. Flavours are clean and sharp, there is no greasiness or heaviness to this food. 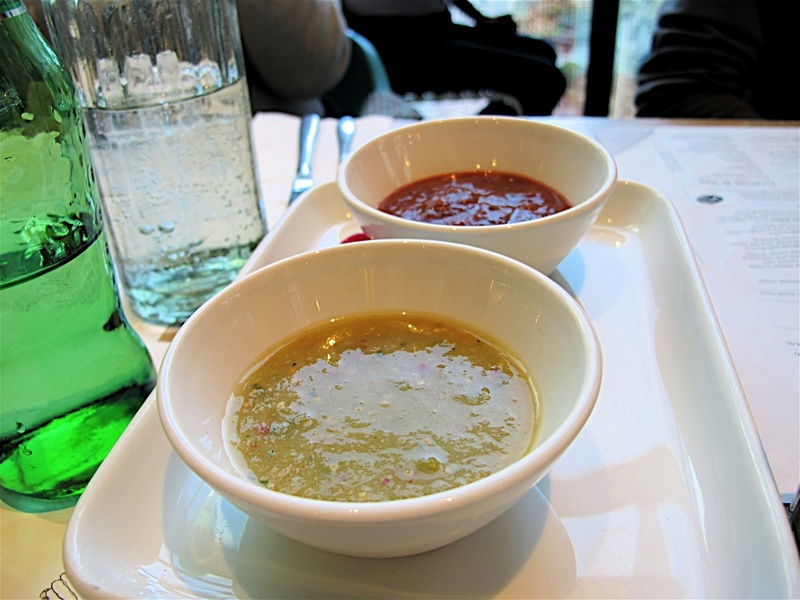 You are also served two types of hot dipping sauce. Keep them away from tiny tongues. My husband drank a Mexican beer, Ted had fruit juice with a straw. We thoroughly enjoyed the Wahaca selection, it was a good introduction for my husband who had never eaten there before. The menu is mostly made up of tapas sized portions of various quesadillas, tacos and less familiar Mexican specialities such as tostadas (a mini salad on a small tortilla) and taquitos (deep fried filled tortillas with cream). For dessert, Ted had some vanilla ice cream with pumpkin seeds (scraped off). I had spicy chocolate ice cream. The latter has an intense chilli hit – not suitable for young children and personally I would prefer it without the spice. 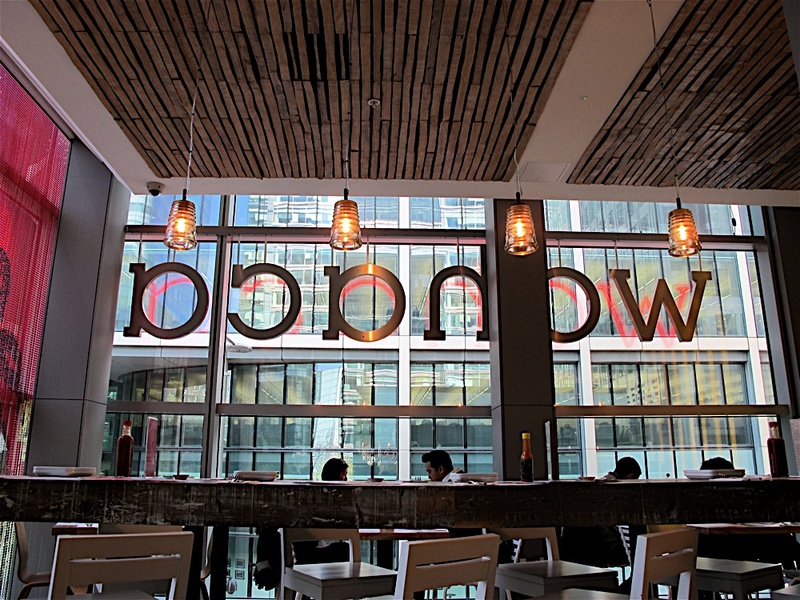 Wahaca makes a refreshing change to the glut of Italian and noodle chains. Their service is prompt, orders are placed via computer and on one visit, Ted’s food arrived before the waitress had finished taking the rest of our order. That’s fast! If making a day of it, you can park for around 5-6 hours for £3.50. The shopping centre is blissfully quiet at weekends (although Waitrose sadly isn’t) and you can also take a short walk to the Museum of London in Docklands or pick up a Thames Clipper to Greenwich. Or get dragged, like us, onto a DLR train to Lewisham. All equally good fun. I really liked this branch of Wahaca when I visited and the Pork Pibil Tacos are lovely, actually all the food we had was. We went on a Saturday afternoon to this branch and there were lots of families eating there. 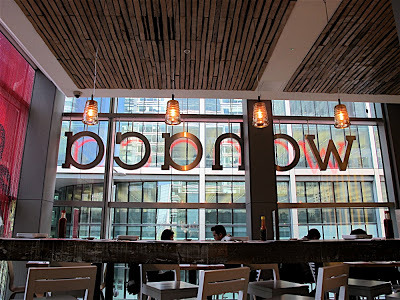 It was also a really welcoming place to eat – the staff were friendly and helpful and gave my husband the option to try some mole sauce pre ordering when he mentioned he wanted to try it but wasn't sure if he'd like it. I recommend the churros for pud (you knew I'd say that didn't you!) and also if you're after a more grown up desert the tequila hot chocolate is divine! I love Wahaca – I've only eaten there twice but utterly enjoyed both my visits. I love the pork pibil tacos! 🙂 Other ones I really like are the fish tacos, the mole taco (I think, I only remember there was mole in it) and the pork scratchings with guacamole. The pork scratchings sound icky but are amazingly good (and light!). I would buy a whole packet of them to snack on if they sold them… 😛 I dread to think what would happen to my weight if that became a reality though. the pork pibil was the only thing i really enjoyed..m glad u had a nice time, im so tempted to give it another shot, but not too sure at the moment. 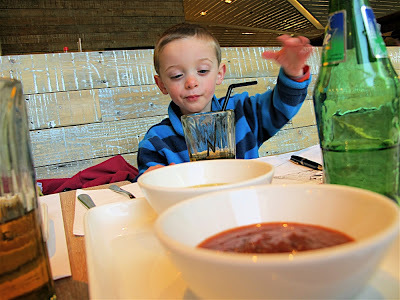 I had the Wahaca selection when I ate there as well – I can't comment on the kid friendly aspects of the place but I did think the food was just ok on my visit – sort of Mexican lite. I'm obviously out of touch – I've never even heard of Wahaca. Where have I been?? Niether myself nor the children are massive fans of anything hot so it would have to be really mild for me but it looks well presented and good portions. But what really won me over was the colouring! That's what I call colouring. Maybe I'll give it a try next time I'm at Westfield. Excellent review, Sarah. As always. I go to Canary Wharf every week day for work and it is really nice to read about it and see its 'humane' side -I will call it. 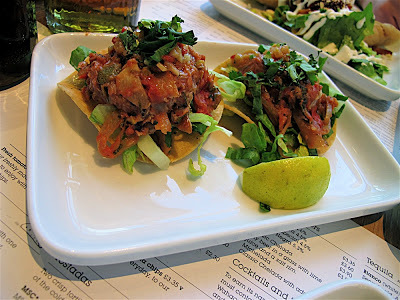 i have had one meal at Wahaca canary wharf and it was really lovely. Tasty food, friendly atmosphere and did not cost an arm and a leg. Heh heh, five comments straight away tonight, you guys obviously aren't watching the football!! @iheartcupcakes You know, I only had churros for first time at Taste of Spain, I would definitely choose them now. @su-yin The name "mole" always makes me laugh. Can only think of moles. @openbook That's a shame, but as I just commented on your post, I probably don't know enough about Mexican food to know any different. I just found that it felt a much lighter and fresher meal than I would get if I walked into GBK or Strada. @gourmetchick As I say to openbook, I can't say I've had authentic Mexican food, only Tex mex rubbish so I found it very appealing. @valentina I know what you mean about a side of Canary Wharf that might not be "humane" as you say. But I am a real sucker for these squeaky clean places with no rubbish and grafitti. It's the closest we get to Monaco!! 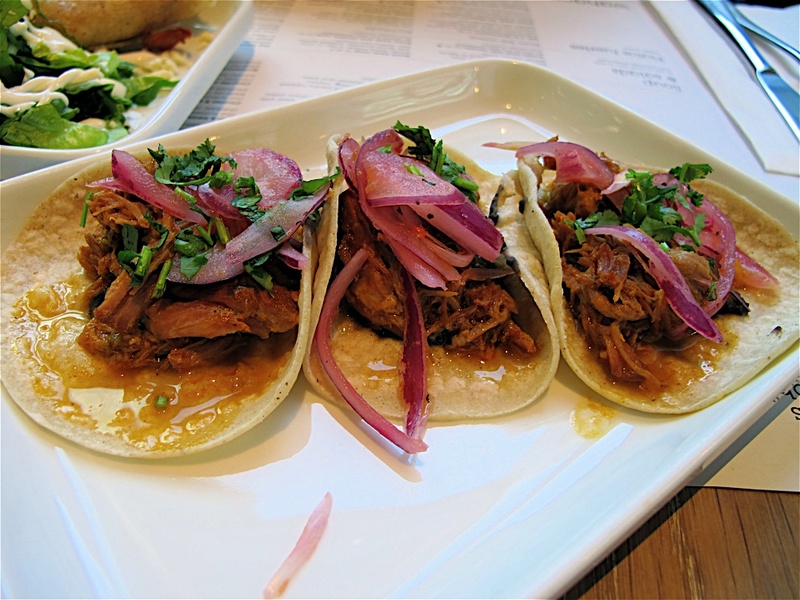 I love Wahaca – especially the pork pibil!! And we won't even go into the churros… :o) So evil they're good! Hi Sarah, I have been to Wahaca in Westfield with my Texan friends and they said it was pretty good Mexican for London–they said that in their five years in London they had never had any really authentic Mexican but that Wahaca was pretty good. I just thought it was tasty! In response to your comments on my post, I am just about to make a new light box. When I moved I threw away the old cardboard box and just kept the diffusion paper. This time I think I'll put openings covered with diffusion paper on the left and right side panels as well, so I can use side lighting. And I plan to cut away the bottom of the box, so I can set the box down on an interesting surface. I'll definitely report how it goes. I wonder about Picasa–do you export to there because then you blog using those pictures? I usually just export from iPhoto to my desktop and then upload into Blogger using the Blogger post editor. Do you think there is a benefit to using Picasa as an intermediate step? I am curious about all kinds of organising questions like this. 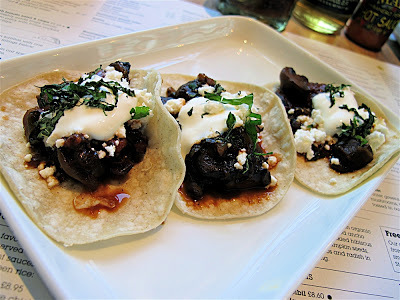 I've been to Wahaca a few times and it keeps this California girl going in a pinch when I'm craving Mexican. I've got a collection of California expats craving Mexican all the time so I usually do a Mexican dinner at home once every two months – if you want to try some authentic (I've smuggled lots of spices from home) stuff let me know and I'll have you over. Your dinner companion is so well-behaved! Cute too! Gosh! I used to stop by at Canary Wharf with friends who worked in the area. The Mexican food looks pretty authentic, and delicious. Your little boy is soo cute! btw, that strawberry decor you were asking me , they are gummy candy. If you like some, i can send a bottle to you. 😀 let me know. Sounds like a great success, all in all – hurrah for Wahaca! oh fantastic! We love the food at Wahaca but the Covent Garden one is just impossible to get into without an hour-long queue (and no reservations!). I didn't know the Canary Wharf one existed – it's way quicker for us to get to, too. thanks for the review! @jeanne I had churros for the first time at Taste of Spain and I'm addicted! @sarah I had the same feeling about those spoons but didn't dare ask/steal one. I bought some similar ones on holiday which I will shortly feature in a post devoted to props. Re Picasa, I am using Blogger in Draft dashboard rather than classic Blogger dashboard which allows you to upload pics direct from Picasa albums. @lorraine I know what you mean, it's less of a problem now that Ted eats proper food and sits on normal chairs! @aforkful I really enjoyed it! @melissa Canary Wharf is very very quiet at weekends. I love it. Ah! I love all dishes. I am so keen to taste them all.